Today the fields of Nations Park lie silent, but in a few short months the cracks of bats connecting with balls will fill the air. NEWBERRY – For months, Newberry has created local buzz about the construction of Nations Park, a state-of-the-art baseball complex just south of the city’s downtown. The $7 million project is now 65 percent complete, according to City Manager Keith Ashby. He estimated that construction would be completed in March, which leaves two months for the turf to mature. The completion of the park will bring in not only crowds for summer camps, but also economic development. 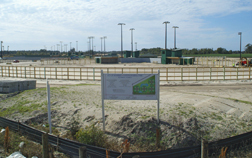 The 16-field baseball park will hold tournaments this summer. The first tournament begins June 22, according to Kyle Donnelly, who is in charge of baseball operations at the park. Donnelly, who goes by Don, said the success of the baseball park is not a hope but a certainty. There have already been signs of the success of the park. The Red Wok Buffet, a Chinese restaurant located in the Hitchcock Plaza off State Road 26, recently opened, and another restaurant, Firefly, is to open in March, Ashby said. A new commercial and residential complex to be built south of Oak View Middle School has also been approved. The City is currently pursuing another Community Development Block Grant to bring infrastructure to the complex. There will be opening ceremonies for the baseball park on the weekend of June 30. The celebration will begin at 10 a.m. with a parade of teams through downtown Newberry, Ashby said. A ribbon-cutting ceremony, complete with fireworks will also take place during that weekend at the park. Nations Park was built by a company affiliated with Cooperstown Dreams Park, a New York baseball park that draws crowds from around the country. The hope is that Newberry’s park will have similar results. “There is a lot of development excitement that has been generated by both the Archery Center and the Nations Baseball Complex,” Ashby said.